FVTC broke ground on its Jones Dairy Farm Culinary Theatre, expected to open in December 2012 on the west side of the Appleton campus. 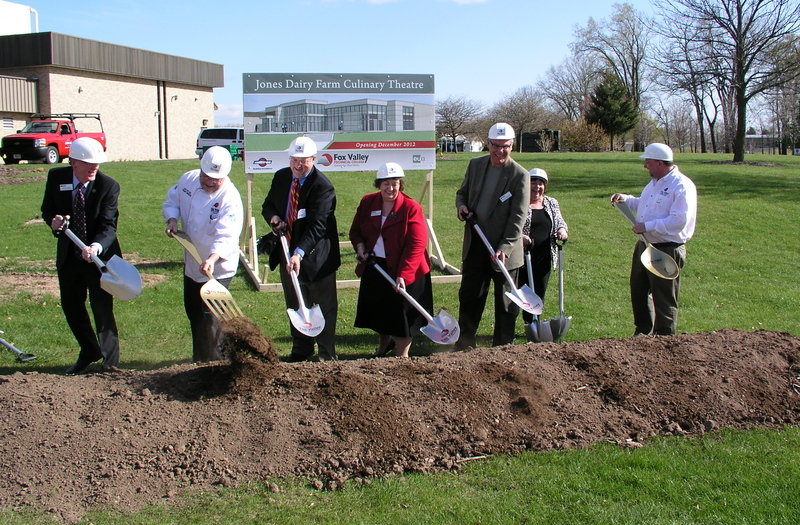 Last week I was pleased to be part of a very special groundbreaking ceremony for what will soon be the Jones Dairy Farm Culinary Theatre at Fox Valley Technical College. So what was special about this groundbreaking? From my perspective, this project exemplifies the College working with an industry, in this case the food, restaurant, and hospitality industry, to create an incredible resource that will benefit students, the community, and the industry. This industry didn’t just talk about their needs for culinary workers; they shared our vision for a demonstration kitchen (a culinary theatre) and stepped forward with pledges, cash contributions and equipment donations. Culinary/Hospitality Department Chair, Chef Jeff Igel, and Director of Food Service, Mike Ciske, took the lead on working with their industry partners to garner support for this project. And President of Jones Dairy Farm in Ft. Atkinson, Wisconsin, Philip Jones, made the lead gift that really got the ball rolling on raising a total of $500,000 toward this project. Everyone’s vote counts, so please vote today. Voting is not only your right as an American citizen, but when you do so, you are part of a very important process where critical decisions are made that ultimately affect everyone. But ultimately, your decision to go to the polls today is a personal one. On behalf of Fox Valley Technical College, I hope that we’ve been able to adequately inform you regarding our proposed capital facilities referendum. Whether or not to make an investment in our work that supports thousands of individuals and employers in this region in the amount of $1/month on $100,000 of property value is really up to everyone in our community. Your decision about helping to make a difference by going to the polls…is really up to you. Thank you for voting today! Every person reading this blog could help make history tomorrow. Tuesday is election day and those of you who live in the Fox Valley Technical College service area will be able to vote on our proposed expansion plan.